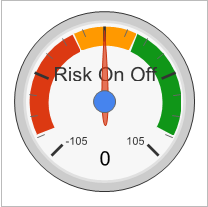 The Risk On/Off Trading Signals gauge relies on data feeds from third party sources. There is no guarantee those sources will remain available or stay reliable in terms of latency (ie how long the data takes to load). A break in the data feed will likely result in several minutes delay before the gauge resets. We can therefore offer no guarantee of the availability of the trading signals gauge and do NOT condone it's use as a basis for real-time trading transactions. The Risk On/Off Trading Signals Gadget is offered as a free tool for EDUCATIONAL and AMUSEMENT Purposes ONLY! It should be used as intended - an educational and / or amusement tool designed to shed light on a particular area of interest to me: Global Financial Markets. It should NOT be considered or used to make trading decisions or investment decisions. Financial advisors are available at your broker for that purpose. The Risk On/Off Trading Signals Gadget has no offer of warrantee or guarantee as to its effectiveness or availability. It makes no claim as to its accuracy or predictive ability. It is merely the mediocre automated rendition in low-budget software of my 20+ years of market observations. This market indicator was created with the intention of amusing and entertaining fellow day-trading and stock market enthusiasts. NO TRADE SHOULD EVER BE MADE SOLELY BASED ON THE SIGNALS INDICATED BY THIS MARKET GAUGE. That said, I hope you find it useful, educational, and fun. ENJOY IT!